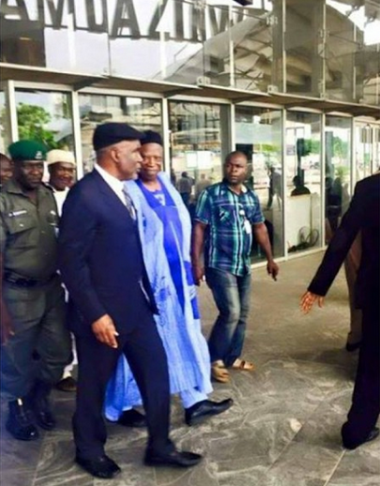 Former Adamawa state governor, Murtala Nyako who reportedly fled Nigeria after his impeachment, returned to the country this afternoon May 30th. He is pictured above as he arrived the airport. The former Governor was impeached on July 15th 2014 over alleged financial impropriety and is believe to have left the country immediately after. Welcome back home. Linda take note! Well, now they can arrest him nd prosecute him. Are u interested in him? Abi u wan apply? He!he!he! See msllam for coat and winter cap. Nyako where is ur military prowess? Just asking. U see d reason we cannot fight boko haram. When a whole retired rear admiral dey run for Jim country. Na me woman go come fight? Shioo! Why is he coming back, especially now we have a leader who is supposedly incorruptible, or do we see it as an act of confidence knowing he will never be held liable by present government? Buhari, we watching! If PNB is as incorruptible as he claims, charity should begin at home. he's married to an Igbo sister and he's a good man! Let's just hope he is punished.we can't anything. Let's just hope he is punished.We can't do anything can we? He wants to eat his cake, and hav it. EFCC should go after him now dat he is in Nigeria. Where are the billions he allegedly misappropriated? of clever work and exposure! Keep up the very good works guys I've incorporated you guys to blogroll.